There’s nothing better than a smoothie on a hot summer day. Chock full of fruit, cold, delicious, and good for you! 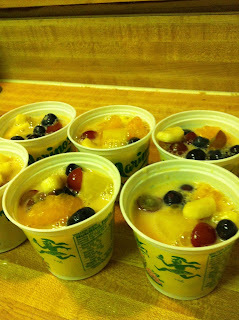 Now, lately, I’ve been making these little contraptions I love to call “frozen smoothie starters.” With the abundance of fruit being in season, now is a great time to put together some frozen smoothie starters and have them waiting in the freezer. This idea was inspired by a cool snack that Ree, aka The Pioneer Woman, did on her Food Network show. I love me some Ree! I started out with ingredients I had right in the fridge: blueberries, grapes, the last bit of OJ, and some Silk Fruit & Protein. I also added in some mandarin oranges and pineapple chunks, mostly because I had them in the pantry. Oh, and a few bananas for good measure. P.S.- we have fallen in love with the Silk Fruit & Protein here! It’s been on sale, so we’ve been able to have it as a fridge staple for the past month. The kids love to have it as a snack once Sonny comes home from school. 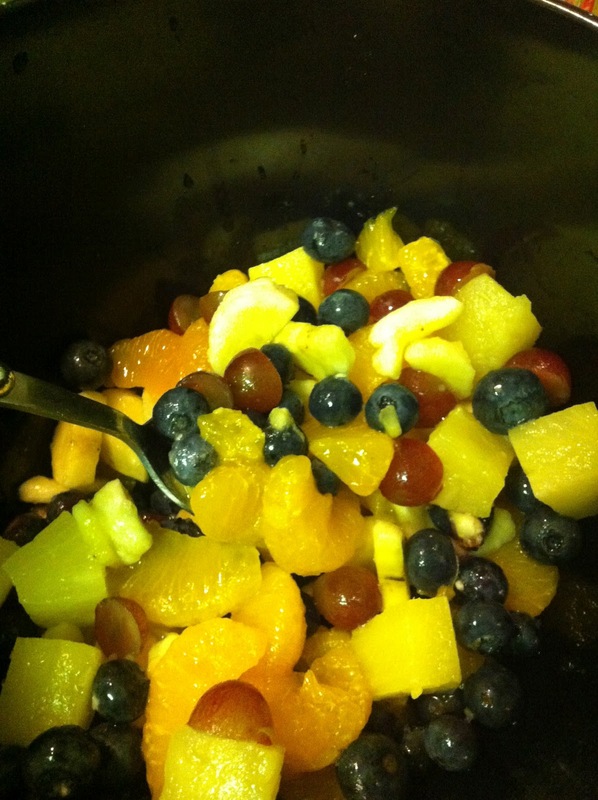 I added all the fruit in a big bowl. I halved the grapes and I cut up the bananas. I actually only used 1 banana, 1 can of mandarin oranges (drained), and 1 can of pineapple chunks (with juice). This looks good right on it’s own, right? 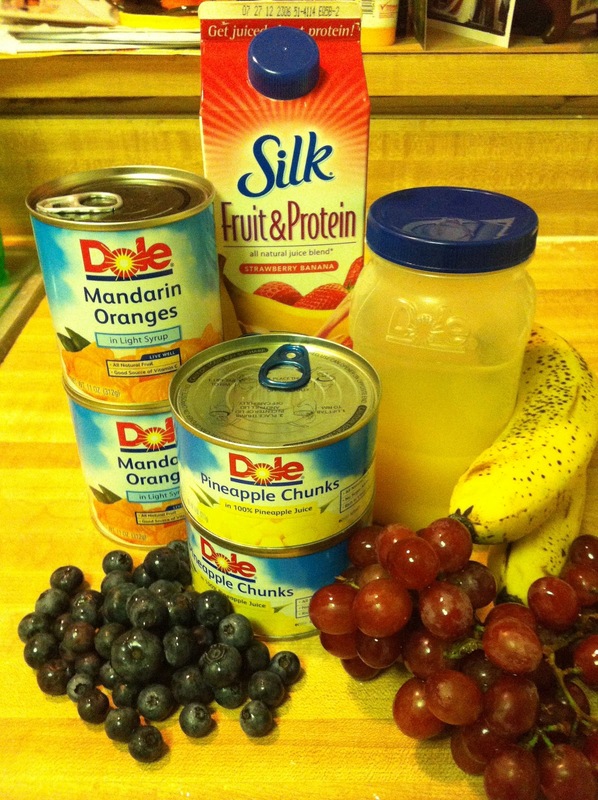 Next, I added in about 1/4th cup of Silk Fruit & Protein and stir all together. If you really wanna get wild and crazy, you can add in a teaspoon of vanilla, as well. Are you drooling yet? I am. Lastly, place the mixture in small containers. These containers are about 4 ounces each. Can you tell what they are? I saved the containers from our favorite water ice that we get from the supermarket and are re-purposing them for our smoothie starters!Once I placed them in the containers, I covered them with plastic wrap and put in the freezer. Once you’re ready to have a smoothie, run the bottom under a little hot water, pop it out into the blender, add in juice, or soy, almond or coconut milk and go to town! Want to use as an afternoon snack? Take a few out in the morning and place in the fridge. By the afternoon it will be cool, slushy and delicious! The kids like when I surprise them with this treat. Disclosure: Don’t get it twisted. Silk didn’t pay me to mention them in this post. I’m sure they don’t even know that my little blog exists. We’re just big giant fans of Silk. They rocks our taste buds off.